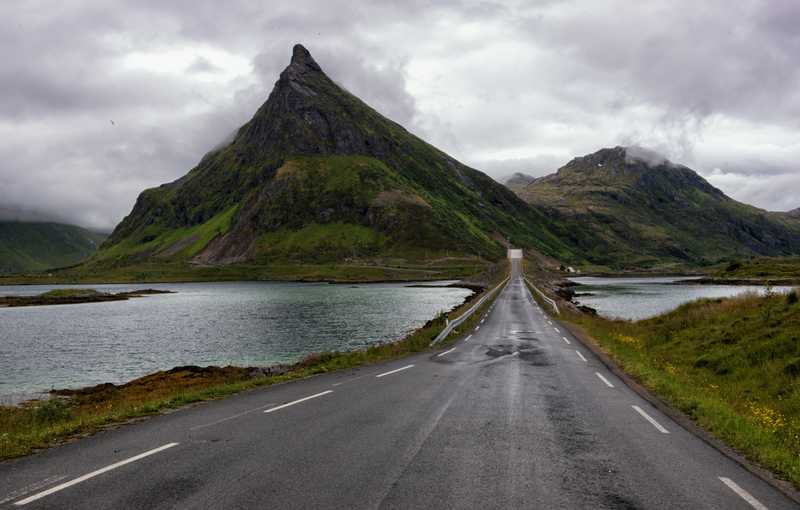 If you’re looking for a place with spectacular scenery and plenty of open road for your next trip, then you shouldn’t look any further than Norway. It’s easily one of the three most awe-inspiring countries I’ve ever been to (the other two being Iceland and New Zealand); combine that with some winding roads that would be more at home in the Alps and you get a dream road tripping destination. A beach near Repvåg in Northern Norway. However, as with anywhere you travel, Norway is not perfect. 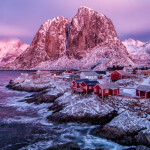 Its reputation as one of the most expensive countries to visit in the world keeps some visitors away and its harsh, stormy winter weather means it is only an ideal destination for part of the year. 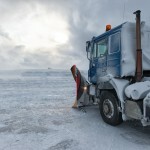 This article in particular will only describe conditions while road tripping in summer, which are vastly different to those I experienced while trying not to drive into a fjord during a winter storm earlier this year. 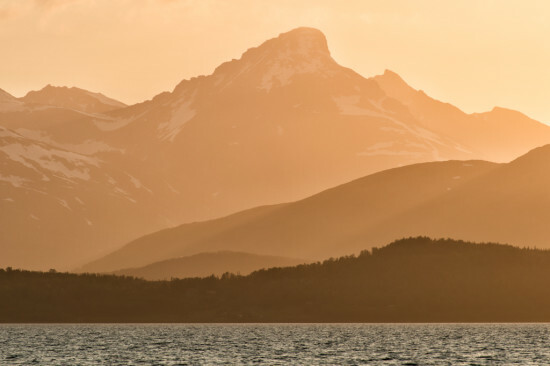 So what should you expect when you hit the road in Norway, whether you’re in the fjords of the south or the barren islands of the far north? The Tjeldsund Bridge on the E10 in Nordland. Even though Norway is by no means the largest country in the world (coming in at 67th by land mass) driving distances can be deceptively long. That’s because it’s hard to drive directly from point A to point B in Norway, since there is usually a fjord or mountain range in the way. 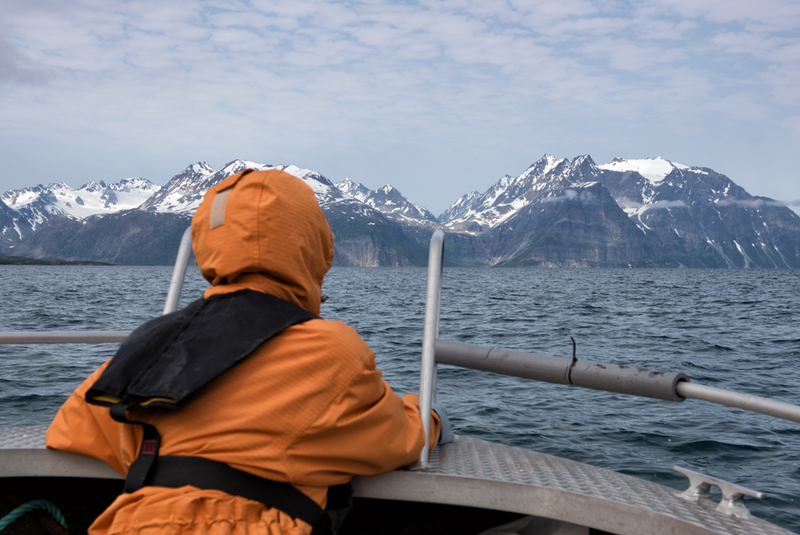 Places that look like they should only be 100km away can actually turn out to be 500km away when you factor in the distance to get around all of these fjords. Speed limits in Norway are quite low, particularly if you are used to driving in other areas of the continent. Aside from a small number of motorways in the Oslo region, the speed limit is usually limited to 80km/h (although particularly straight sections of road can have limits of 90km/h). You’ll definitely notice the difference between this and the 100km/h limits of Finland, or the 120km/h+ limits common in other European countries. 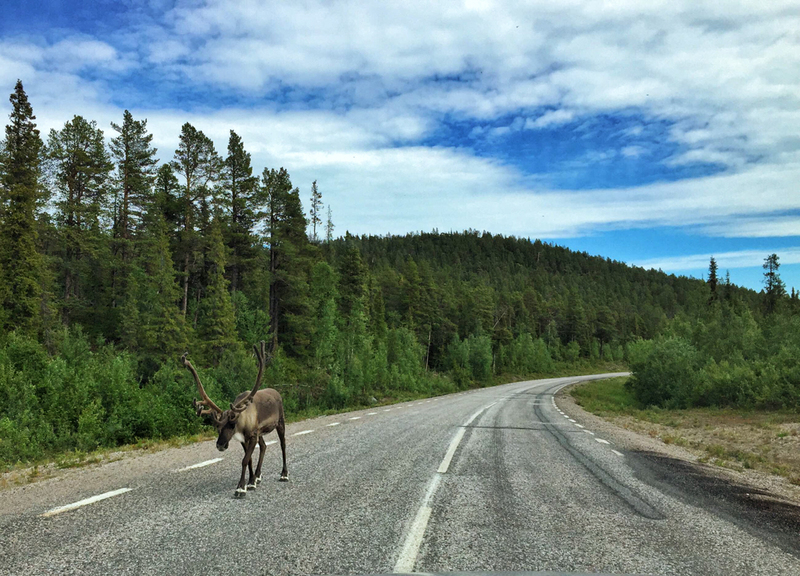 The speed limit in Norway is low for a reason. 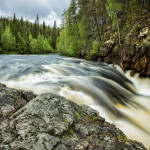 The roads are windy and often have corners that would not be navigable at higher speeds. I found many sections of road, particularly around Lyngenfjord, where it was difficult to even get up to the marked speed limit before hitting yet another tight curve. 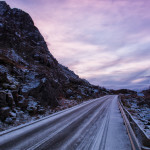 On the road in Lofoten. It’s good that you won’t spend your entire trip blazing across the countryside without a chance to look; it means that you’ll probably find a few stopping places that you wouldn’t have otherwise. However, there are two downsides. The first is Google Maps. It appears to estimate all times based on the posted speed limits, and if you are on a windy section — or you are stuck behind one of many caravans on the road during the summer months — that speed is more of a fantasy than a reality. As a result, I found that I needed to multiply all Google Maps driving times by at least 1.5 to accurately estimate when I might arrive. The mountains around Tromsø glowing under the midnight sun. The second is the chance of speeding. 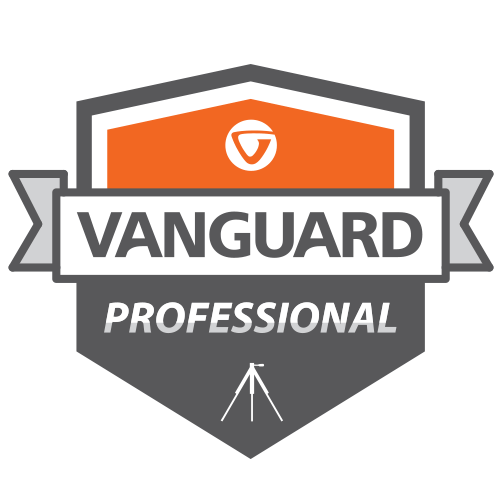 You’ll find speed cameras in both urban and remote areas, which are signposted with the standard “speed cameras” sign beforehand. 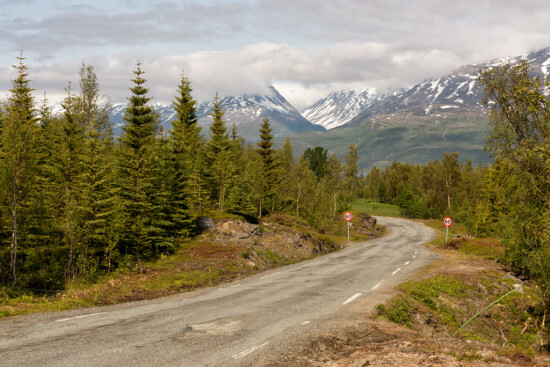 Norwegians do not take speeding offences lightly and a quick trip past a speed camera could cost you several thousand kronor. Nordkapptunnelen, the tunnel between the mainland and Magerøya in Finnmark. 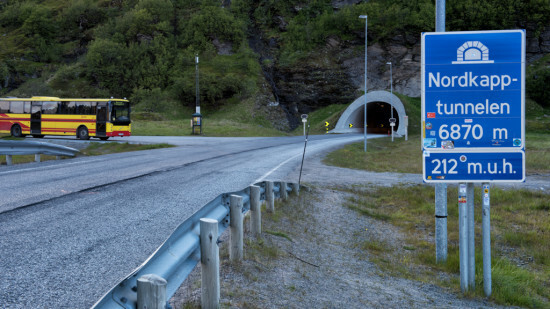 Mountains with sheer drops straight into the water and multitudes of islands don’t make for easy road building, so tunnels are often the only option in Norway. The country has by far the most tunnels of anywhere I’ve ever visited. These tunnels aren’t short either. The longest tunnel I’ve been through was 11km, and it was immediately preceded by a 10km long tunnel. The tunnels can seem so long that you start to lose track of how long you’ve been in them; on occasion, I even struggled to tell if the car was on a gradual incline or decline. 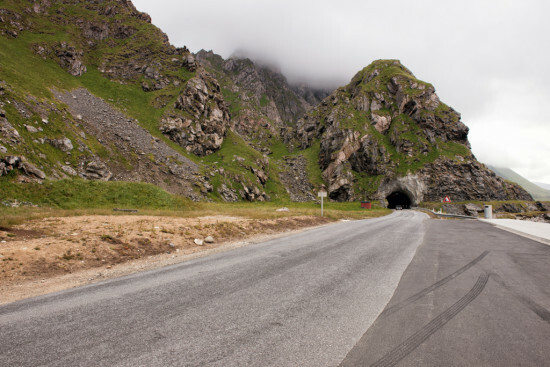 They also give off the impression of just having been blown out of the earth and opened to the public, since the walls of the tunnel are usually blasted rock rather than smooth concrete surfaces. A tunnel near Andenes in the Vesterålen Islands. Luckily, the authorities are aware that being underground for more than a few minutes can be disconcerting, so there are a number of signs around all tunnels. Prior to the tunnel, a sign will tell you the name of the tunnel and how long it is. Once in the tunnel, signs begin to appear with two arrows; one pointing backwards with the distance you have covered, and one pointing forwards with the distance left to go. Also signposted in the tunnel are SOS phones and emergency pullout locations. I never used these on my summer road trip, but in winter they were great spots to pull off and remove all the ice from my windscreen wipers! It’s important to know that there are often speed cameras in these tunnels, particularly if there are steep downhill grades. The speed limit will be posted throughout the tunnel and will generally range between 60-80km/h. It’s a good idea to set your car on cruise control to ensure your speed doesn’t gradually creep up. 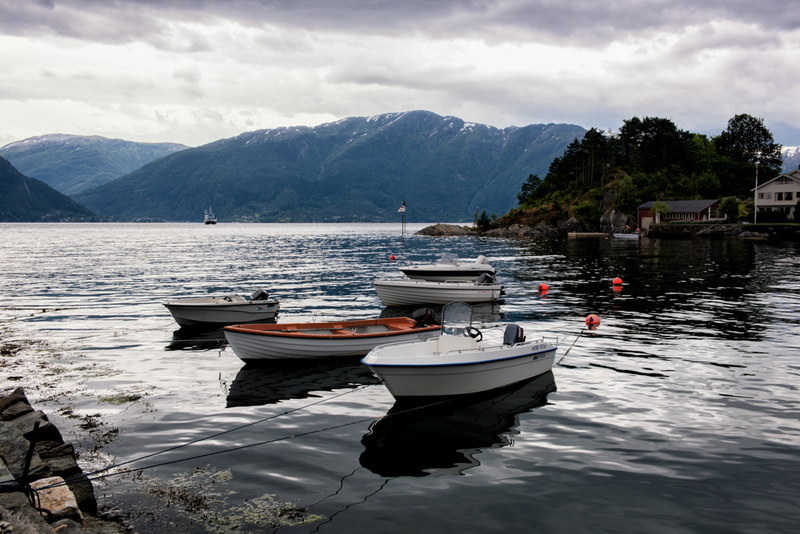 Boats in Hardangerfjord, with a ferry in the background. If there’s a body of water to cross and it’s just a bit too far — or not quite busy enough — for a tunnel, you’ll usually find a ferry operating there instead. 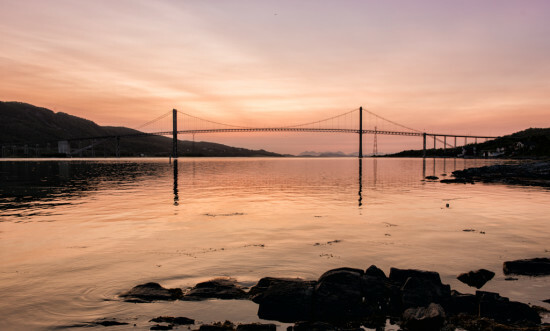 Unlike a country like Scotland, where the vast majority of ferries are operated by one company, these ferries are operated by a variety of smaller operators. I often found it easiest to just google my route, get the names of the start and endpoints for the ferry (for instance, the Svensby-Breivikeidet/Rv91 ferry on the road between Tromsø and Lyngen), and then plug that name into Google to bring up the operator’s website and a timetable. Fares vary based on distance covered and whether you are a foot or vehicle passenger. In the summer of 2015, the price was usually between 150-250kr for a one-way ferry crossing. It’s rare to be able to pre-book a ferry crossing; they are usually first-come, first-served. Most ferries are quite large and I only once saw one arrive and depart without taking everyone waiting in the queue. Tickets are sold by ticket collectors that travel with the boat and walk up the line upon the boat’s arrival. Their ticket machines take both cash and credit card, and there were never any issues with taking my credit card as their machines recognised my foreign chip and PIN. Even though I said above that only one ferry ever departed without everyone that had been waiting for it, I highly recommend doing your research on the ferry you are planning to take and its regularity/popularity at that time of year. Crossings such as those on the E39 between Stavanger and Bergen are constant and run late into the night, so if you miss one ferry, it won’t be much of a problem. 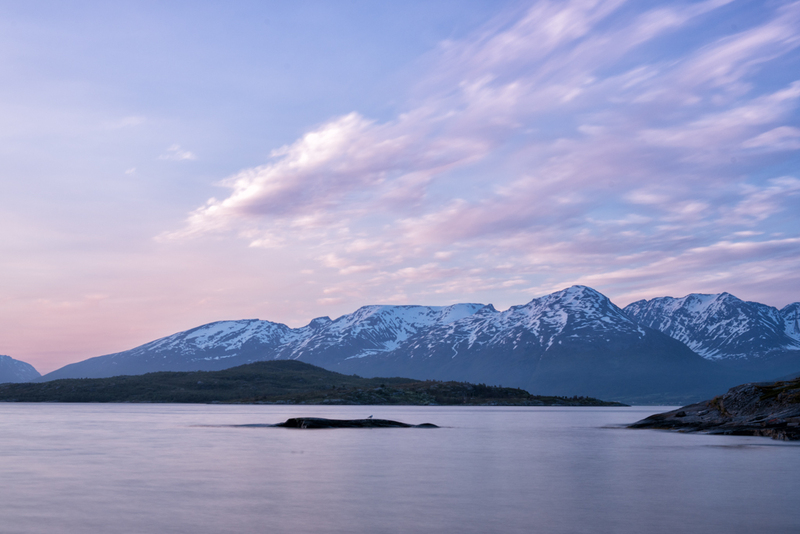 Midnight sun colours lighting up Lyngenfjord. However, other ferries run only once or twice daily, and if you get left behind it will create a significant problem for your holiday plans. That’s what happened to me when I tried to catch the Senja (Gryllefjord)-Andenes ferry. 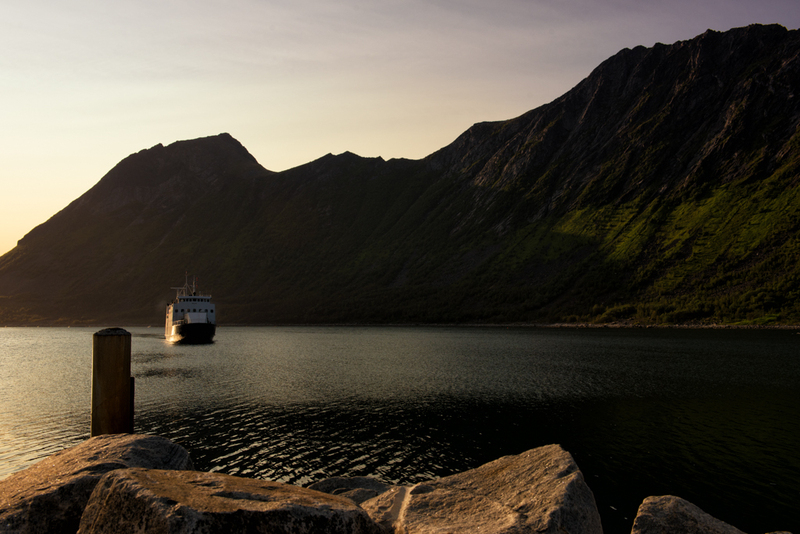 This ferry operates three times daily during the summer months and turns a 500km drive into a 2hr ferry crossing, and importantly, it was supposed to get me from Troms to the Vesterålen Islands in one day. I arrived at the ferry 45 minutes before the final departure of the day (around 6.15pm). 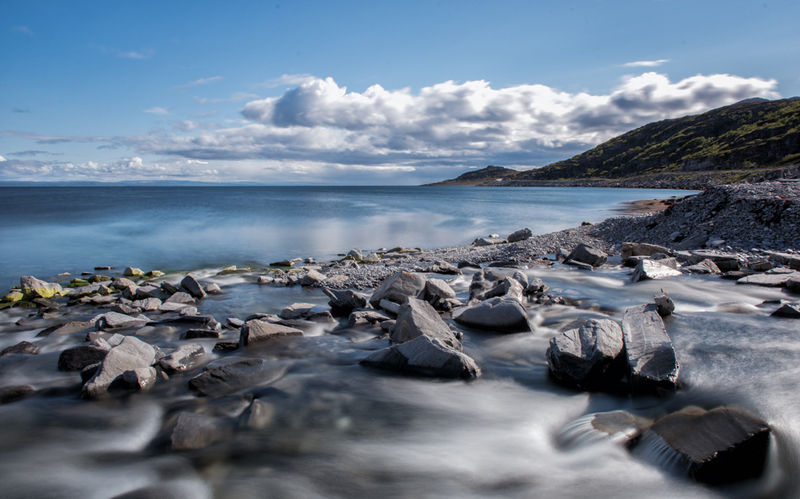 There were only four short lines in the parking lot to accommodate all the waiting passengers, and the line stretched a fair distance along the main road through Gryllefjord. There was no way to buy tickets, even from the office nearby, so everyone stood around trying to figure out what their chances were until the ferry arrived at 7.30pm. The Senja-Andøya ferry comes in to port. Unfortunately, the ferry was one of the smallest I’d seen in Norway and took almost exactly the number of cars that could fit in the carpark, leaving more than half of the vehicles behind…including mine. That left me 500km away from my hotel at 8pm, with the next ferry scheduled to arrive at 11am the following day. Add to that the fact that most of the people that were left behind were planning to sleep in line — something I couldn’t do due to online work commitments — and it was not a fun situation. Not only did I end up driving until 1.30am to make up as much distance as possible, but I also had to rearrange the next few days of my trip to make up for what I’d missed. From that, I learned never to leave important ferry crossings until the last ferry of the day. 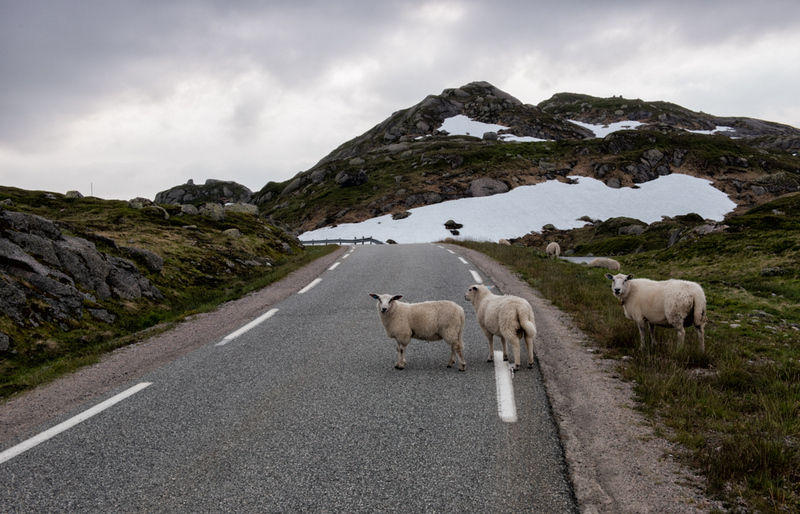 Sheep hanging out on the road to Lysebotn. In the majority of Norway, the animals you have to worry about finding on the roads aren’t exactly wild, but that possibly makes it worse, since cars don’t bother them as much as they should. Sheep roam freely across many roads, and at night, you’ll find that they like to sleep on them too. If you find a flock of sheep on the road, I found that it’s best to slowly move forward towards them until they eventually move. If you stop, they’ll just stare at you and chew cud. It might be a long standoff. 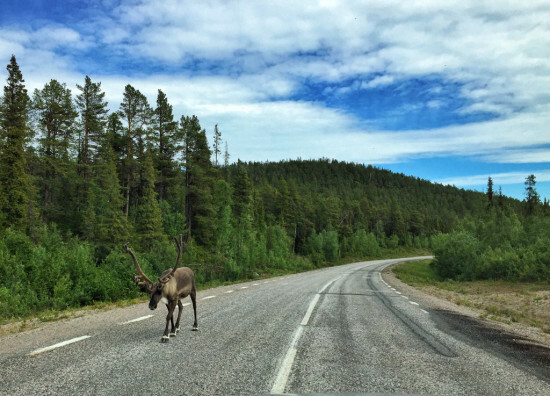 A reindeer strolling down the road in Swedish Lapland. 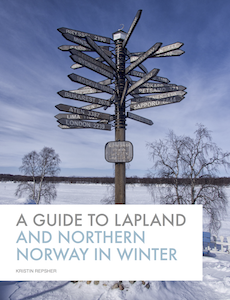 Reindeer are found mostly in Finnmark county in Northern Norway. Like sheep, they are often not even remotely bothered by the presence of cars, and they have a bad tendency to run alongside the road and then bolt in front of you. If they appear to be eating, there’s less chance that they’ll run, but you should always keep a good eye on them. I constantly scanned the verges on both sides of the road just so I could be aware of any reindeer in the area. This is by no means a comprehensive list of everything you’ll encounter while road tripping through Norway and its fjords, but I hope that it minimises the “gotchas” that may resort in delayed schedules, speeding fines, or worse. The main thing to remember is that you’re on the road in one of the most beautiful countries in the world, so enjoy it and take advantage of any pullouts you find along the road to stop and take it all in. My Norwegian road trip was partially sponsored by Visit Norway, but all opinions stated in this piece are my own. I drove roughly 2,300km in Northern Norway and drove/was a passenger for about 700km in Fjord Norway.